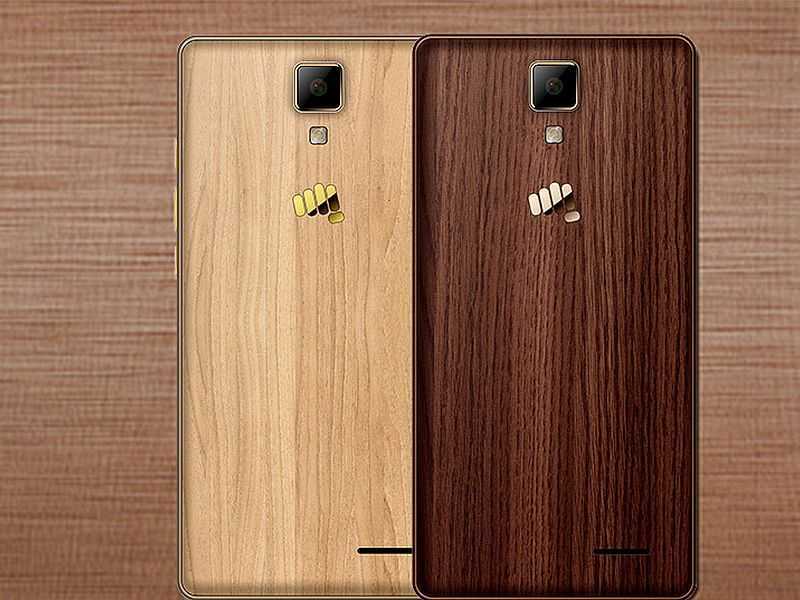 While the nation was busy with Independence Day celebrations in mid August, Indian manufacturer Micromax published limited details of the special edition of its Canvas 5 Lite smartphone online. Launched as a successor of the Canvas 5, there is however no mention about the price or expected time of availability of this handset. The key reason why this device created a sensation is due to the wooden look that it offers. By using the term wooden look, it must be understood that unlike its OnePlus counterpart, the company only gives the rear panel of its gadget a wooden finish and not a real wooden construction. You can choose your black smartphone from one of the two offered wooden finishes – either a maple wood finish or a walnut wooden finish. Whichever option you choose, the good news for you is that the Micromax Canvas 5 Lite supports 4G connectivity. While some of the features are the same as its Canvas 5 big brother, a few others are quite different. The company has not mentioned the exact size of its upcoming Canvas smartphone. However, from information available about other parameters such as screen size, the Lite handset is very likely to be a tad smaller than the Canvas 5. However, both devices are said to share the same plastic body construction. The wooden finish helps in replacing the cheap look of smartphones using this body material with a statement of style. Since there is no difference in this material and the overall size is speculated to be slightly lesser, the Canvas 5 Lite is also bound to be not as heavy as its predecessor. But, unofficial online sources estimate the weight to be around 144g. If this proves to be true, the device will be quite light and compact making it easy to hold and operate. The Micromax handset will arrive with a 5-inch HD screen with multi-touch support and 16 million colors rendition to account for maximum entertainment benefits. The IPS screen is slated to have a pixel resolution of 1280 x 720 and a pixel density of 294ppi that is typical of devices with screens of this size. There are alsotalks about the display screen being protected using Corning Gorilla Glass although there are no confirmed reports about this. True to its name, the primary camera on the rear of the Micromax Canvas 5 Lite will not be the same high end snapper as that of the Canvas 5. The 12MP camera is going to be replaced by an 8MP shooter with an LED flash and a CMOS sensor. Photos shot will showcase 3264 x 2448 image resolution while videos are recorded at 15 fps with 1280 x 720 resolution in mp4, 3gp and avi formats. Apart from rendering the standard functions of usual primary shooters, one noteworthy feature is the capability to capture voice in photos. Nothing will change in the secondary camera department. Things will remain exactly the same with a 5MP camera portraying 2560 x 1920 image resolution. Things are said to be more or less the same as that of the Canvas 5 as far asthe hardware details are concerned. The device will incorporate a 3GB RAM with a MediaTek MT6735P chipset, a quad core 64-bit ARM Cortex A53 1GHz central processor and a dual core ARM Mali-T720 MP2 graphics processor. The 16GB onboard storage can be tripled to 48GB by using a memory card to expand the memory externally. On the software front, Micromax fans will face a bit of disappointment as the smartphone is rumored to come with Android 5.1 Lollipop preloaded. This can be quite upsetting as there are already many smartphones in this price range with Android 6.0 Marshmallow preinstalled or update available. Moreover, this comes as a bombshell as Android 7.0 Nougat is heading towards its roll out date. According to the company’s website, the Canvas 5 Lite will offer support for Wi-Fi, Bluetooth and WAP connectivity. However, information leaked on third party websites state the inclusion of GPRS/EDGE and GPS, apart from a micro USB port. Like almost any other Micromax handset, the Lite device finds its place in the dual SIM category by offering provision for inserting two micro SIM cards at a time. Yet, only one of them will be active at a time. The Micromax Canvas 5 Lite will get its juice from a 2,000 mAh removable Li-ion battery. The battery is said to render 4.5 hours of non-stop talk time and 150 hours of uninterrupted standby time.